Research Associate Dr Charles Featherston spent two months embedded in the Manufacturing Policy Team in the Department of Business, Innovation and Skills (BIS). During his time, Charles drew on theoretical models of emerging technologies and industries to explore how the various stages of emergence and the various technologies involved were being supported by government programmes. Charles developed a case study for BIS internal use on additive manufacturing, which also provided insights on the practicality and robustness of these emergence models. This project paired Charles’ interest in emerging technologies and the Manufacturing Policy Team’s interest in manufacturing in the UK’s industrial sectors. Charles also used the secondment to become closely acquainted with the various innovation roles performed by BIS and its innovation agencies. It also required him to form a detailed understanding of the 2010-15 Government’s Industrial Strategy. The five-part strategy coordinated newly introduced programmes and adjusted existing programmes to develop a concerted effort to support innovation, develop the national skills base, and encourage business growth. 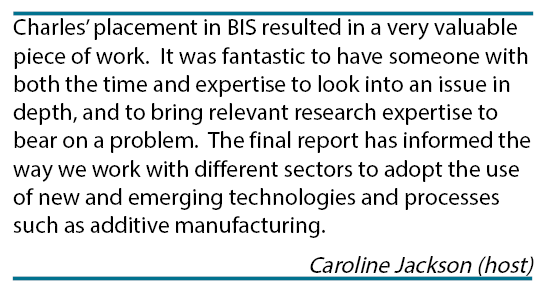 Being in a team situated in the Manufacturing, Services and Electronics (MSE) unit, in the Advanced Manufacturing and Services (AMS) directorate, Charles in particular explored BIS’ three tiered approach to sector partnerships (an integral part of the Industrial Strategy). He spent time understanding various sectors’ leadership councils, forums, and groups; the role BIS’ sector teams played in supporting these partnerships, and how these partnerships saw their role with respect to emerging technologies. Charles produced an internal report outlining the UK’s approach to industrial policy and their specific implications for additive manufacturing. The report was used to inform the Manufacturing Policy Team’s activities and frame the relevant additive manufacturing activities of Innovate UK. Lessons learnt from the project continue to be drawn on to inform Innovate UK’s Emerging Technologies and Industries programme.